A mission in the Land of Oz would be, I imagine, a frustrating thing. Without a brain, you'd have to teach the Scarecrow even the simplest concepts over and over again. Forget about the Tin Man ever feeling the Spirit--he doesn't have a heart. And any Lion investigators would never show the courage of commitment. And then there's the Wicked Witch of the West: if anyone in Oz needs the cleansing power of the gospel it's her (what with her likely Munchkin genocide and unnatural primate experimentation). 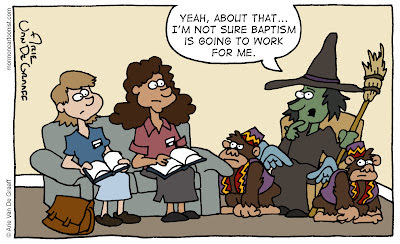 And yet, thanks to her severe allergy to water, baptism will forever be out of the question. A General Conference Activity Packet available to download at sugardoodle.net and ldsclipart.com. The LDS Scripture Heroes app includes dozens of scripture heroes from the Standard Works in five different puzzles games. The LDS Coloring Book app now includes over a dozen different coloring books covering a number of different topics. It's awesome and will keep your kids busy for hours (you can also print each of the coloring books and color them with crayons and paper, just click on each individual coloring book from the link provided above). LDS Laughs isn't much of a resource for anything, but you're more than welcome to downloaded it in preparation of this weekend anyway. I absolutely love the calm little monkey pets she has. I've heard those things can go nuts on you if you're not careful. Maybe she could take allergy shots? But then again, it would be the water that was diluted. Dunno what they'd use.